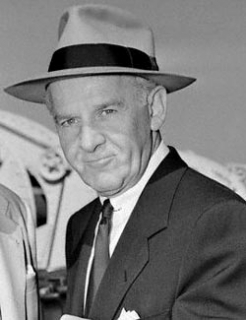 Walter Winchell was a radio newscaster and columnist who gained a massive audience by being an opinionated gossip. He had a weekly radio program from 1932 to the early 1950s which consisted of his strong opinions rather than detached news, and a gossip column in the New York Daily Mirror which became syndicated. According to Wikipedia, he would start his broadcast with the staccato ticking of a telegraph key and “the catchphrase ‘Good evening Mr. and Mrs. America from border to border and coast to coast and all the ships at sea. Let's go to press.’"
Because he started in vaudeville, he adopted a style of speaking and writing filled with "Broadway idiom." He was known for his interesting phrases which he peppered throughout his reports and column. He fell out of favor when he went overboard supporting Senator Joseph McCarthy and the public’s appetite for McCarthyism turned sour. Until he supported the senator, he had had many friendships with celebrities. Winchell used his voice as the invisible narrator for The Untouchables television series from 1959-1963. He died in 1972, at age 74, from prostate cancer. Just to poke fun at myself--when I was a kid, I used to get Walter Winchell and Winchell-Mahoney (a TV show) mixed up. Here is his Wiki Page. Books about him and by him. Source Articles: Encyclopedia Britannica; Walter Winchell Biography; The Age of Winchell, and his Wikipedia page.